YES! I'd like to streamline my after school enrichment programs. Tell me more! Does your school offer after-school enrichment programs? Are you an enrichment volunteer coordinating vendors, parents, schedules AND sign-ups? There is an easier way! Let ActivityHero tools power your after-school enrichment program! Say good-bye to paper flyers and chasing parents for checks. 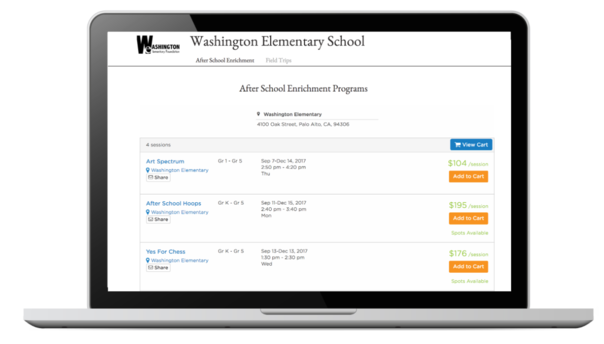 After-school program schedules appear on your school website. Parents see availability, register, and pay online. "The email confirmation means I don't have to wonder whether my check made it to the right person." "I can see schedules, pricing, and availability on my school's website. It's always in the same place." "I can register anywhere, anytime -- even on my phone or late at night."